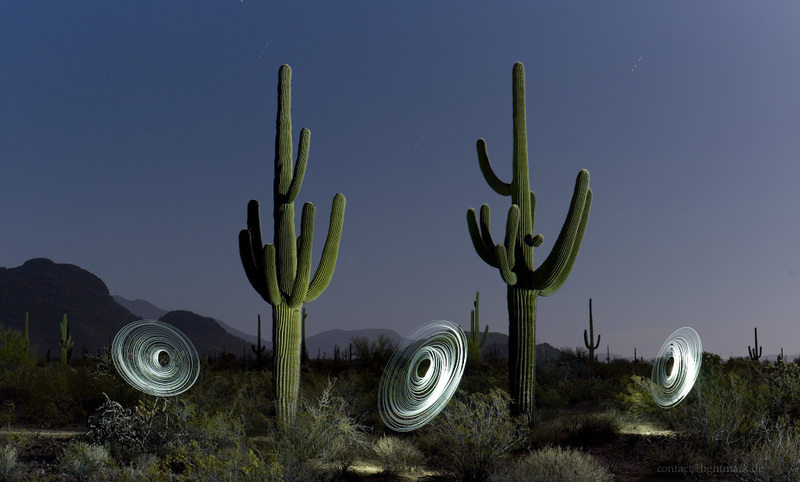 Light Painting and Landscape Photography: Saguaro Cactus, Organ Pipe Cactus National Monument, Arizona.Saguaro Cactus, Organ Pipe Cactus National Monument, Arizona. Lightmark No.112 Saguaro Cactus, Organ Pipe Cactus National Monument, Arizona. Organ Pipe Cactus National Monument is a U.S. National Monument and UNESCO biosphere reserve located in extreme southern Arizona which shares a border with the Mexican state of Sonora. The park is the only place in the United States where the Organ Pipe Cactus grows wild. The Park is a beautiful preservation of the American Southwest. About Cenci Goepel and Jens Warnecke N 31°57'22.92" W112°47'37.44"